1. There are much worse challenges – self-imposed or otherwise – that people face on a daily basis. Cooking and eating your way through a book of recipes dedicated not just to the area you live in, but to the produce that is grown, reared or caught there, is definitely not one of them. 2. The back has been broken! I have just 3 weeks left of having the best excuse to buy eight pats of butter in the shops without batting an eyelid, to tut over my friends for not doing more to support their local butchers/bakers/candlestick makers, and to spend hours at a time cluttering up the kitchen sink with spatulas and saucepans, refusing entry to anyone in the house because ‘I’M WORKING! YOU’LL HAVE TO COME BACK LATER!’ Only 10 more recipes to go, and it’s all over. 3. Buying local has become second nature. As Ruth proved whilst undertaking her six-month Choose Cornish Challenge, it’s all about small changes to your routine and shopping habits, and before you know it you’re giving someone a blank, disconcerted look when they try and justify buying Guatemalan strawberries for £5 from the supermarket in December. It’s a wholesome, warming and slightly smug feeling – I urge you to try it. 4. Finally, this book has taught me techniques I’d always dismissed as being out of my league for the past 8 years of being a grown-up who cooked actual proper meals for myself. Before this challenge, I’d never have dreamed of merrily dicing up raw shellfish to eat for breakfast, or picking flowers to put into homemade confectionary, let alone that something like Cornish Splits even existed, or that they were so darn tasty. I’ve loved it when things went wrong, and even more when they went right, and it’s been really refreshing to step out of my culinary comfort zone. I only managed one recipe due to a spontaneous trip to the BBC Good Food Show in Birmingham at the weekend, BUT everything is definitely on track to finish this thing in just over 2 weeks’ time. 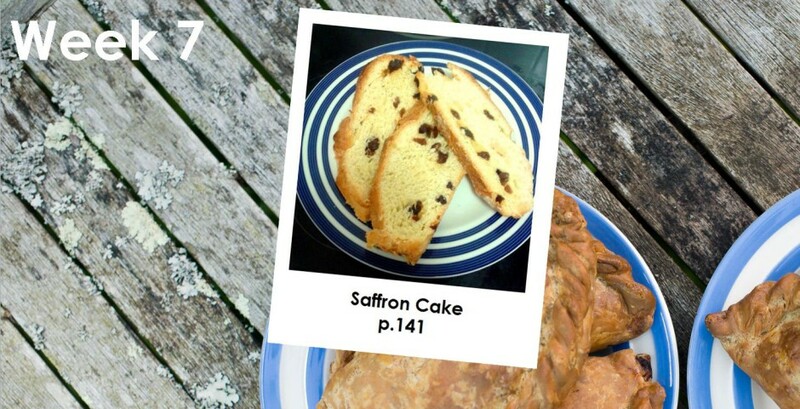 Perfect for: Similar to pasties – name me a time when it is NOT appropriate to be eating saffron cake, and you’ll receive a withering look and a gentle nudge across the Tamar. This is a wonderful, easy, sumptuous recipe – even the dough is irresistible. There’s a perfect balance of saffron-y sweetness too; experience tells me that including too much saffron not only costs you a small fortune, but it kind of starts to taste a bit like TCP, which is no fun for anyone. I got a couple of big loaves out of it – one of which went towards a really amazing bread and butter pudding, the other was eaten in slices with yet more butter. Lovely stuff. This was another failed week for Megrim Sole – working full time means that it’s very hard to find a fishmonger who’s still open at 6pm, given that the fishermen are up and working throughout the night and into the wee hours, so I’m restricted to finding it at the weekends. Anyway, next week is definitely the week. Watch this space. To buy a copy of the Great Cornish Food Book (and to be in with a chance of winning a hamper of Cornish goodies) click here.